At BMW of Westchester, we’re committed to the customer experience. We’re happy to provide exceptional assistance to each driver from the Westchester County, White Plains, and New Rochelle areas when the time arrives for them to find the right BMW model. 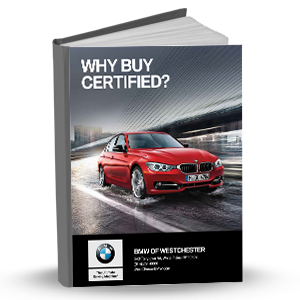 While we have several research materials available to help drivers learn more, we also have eBooks available full of relevant BMW information that are informative, detailed, and helpful with several aspects to the luxury car-buying experience. Each of our eBooks has a focus, whether it’s more details on a specific model, steps of the luxury car buying process, or information on the proper care and maintenance of your vehicle. These free eBooks will give you the details that you need before making a major decision towards purchasing your next vehicle, or knowing when to schedule a service appointment when your vehicle needs some light maintenance or extensive servicing. When you come across this page, you’ll see several different eBook titles that are free for you to download. By browsing our selection of eBooks, you’ll be able to determine which one seems relevant to your current situation. All you have to do is download the eBook and you’ll be able to reference it whenever you need it. These comprehensive eBooks will provide you with the information that you need to know throughout your experience. Each of our eBooks are free for you to download and read at your leisure. When you’ve figured out which eBook you’ll want to get, all you have to do is fill out the form on its page with some basic information about yourself. Then all you have to do is click “download,” and you’ll get your free copy right away. Then you’ll be able to use your eBook to gain the insight you need to help you throughout your experience with us at BMW of Westchester. At BMW of Westchester, we’re proud to help drivers in the Westchester County, White Plains, and New Rochelle areas with dedicated assistance, expert customer service, and informative eBooks to help them on their journey. Contact us today to learn more!